This article will help you keep insects off your trees. As with any other organic life form, trees can experience problems with pest's. As human beings, who see these critters attack our trees, the question becomes: To kill, or not to kill the critters. Sometimes, spraying a broad spectrum insecticide can actually do more harm than good when beneficial insects are killed in the process. So when we see a bug on a tree in our landscape, we should first attempt to identify the type of insect, and whether or not it is listed as a harmful pest, or a beneficial insect. If you see a ladybug on a leaf, he's probably busy feasting on aphids. So, as you can see, identification of an insect can be very important. All in all, there just aren't too many insects that do a whole lot of damage to a tree, much less kill the tree. There are the pine borers that can bring down a large pine, and the tiny little Asian Ambrosia beetle that can kill small flowering cherry trees and other flowering trees. But aside from these, there just aren't too many life-threatening bugs flying around. Some insects are here today and gone tomorrow without doing a bit of harm. 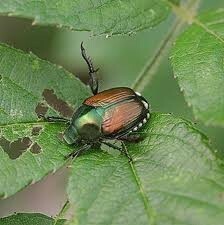 Others, such as the non-native Japanese beatle can hang around for weeks or months chewing away at foliage and flowers. What insect control products to use? There are several generally safe products for use to control common insects and/or diseases on trees. Neem Oil - Neem oil (azadirachtin) acts as a feeding repellent that can prevent attack by many types of pests and diseases. It also can affect the growth and development of some pests which may suppress problems. Susceptibility to neem varies greatly among different insect species so check the label careflly to be sure that it covers pests that you are trying to manage. Pyrethrin - Products containing pyrethrins are very broad spectrum insecticides. They attack the nervous system of almost all insects and other arthropods, including spiders and mites. Pyrethrins are very effective as contact sprays but are deactivated very quickly by sunlight, moisture, and air so no residue is left behind. Sevin / Carbyrl - When it comes to controlling the Japnese Beatle (pictured right), nothing works better than liquid Sevin spray. Inspect your trees regularly and watch for signs of insect infestation or disease onset. If you're not sure what insect it is that's attacking your tree, have your local arborist take a look or consult with your local nursery and garden center professional. After identifying the insect as a harmful one, spray with an appropriate product. To avoid problems, follow all label directions carefully, and make sure your plant is listed on the label. The best method for application is a pump-sprayer for smaller trees, or a hose-end sprayer for taller trees.